The Big Wobble: A must see and could be the last chance for many in the UK and Western Europe to see this Phenomenon "Super Wolf Blood Moon"
A must see and could be the last chance for many in the UK and Western Europe to see this Phenomenon "Super Wolf Blood Moon"
I'm the idiot who dragged himself out of bed this morning at 5: am to see the Super Wolf Blood Moon only to realise I was a day too early! It will be the last chance for skywatchers in the UK and Western Europe to see a total lunar eclipse in its entirety until 2029 which means it is probably the last chance for many to see. According to Spaceweather.com, it's going to be super. On Sunday evening, Jan. 20th, at 8:41 pm PST (11:41 pm EST) the shadow of our planet will engulf the full Moon, transforming the grey lunar disk into a coppery-red orb. The eclipse will be "super" both figuratively and literally. During the shadow crossing, the Moon will be within 14 hours of perigee, its closest point to Earth. This makes the Moon a "supermoon," almost 8% wider than an average full Moon. Normally, a supermoon would be about 16% brighter than average. The eclipse, however, will dim the supermoon, allowing stars to pop out around the swollen orb. Walter Freeman, an assistant teaching professor at Syracuse University in New York state, said: "A little bit of sunlight is refracted by the Earth's atmosphere and reaches the Moon, bending around the edges of the Earth. This small amount of red light still illuminates the Moon enough for us to see it." Tonight a bright full Moon will fade to red. Tonight's moon will be particularly bright because it is reaching its fully lit phase when it is relatively close to the Earth in its elliptical orbit. In fact, by some measures of size and brightness, tonight's full Moon is designated a supermoon, although perhaps the "super" is overstated because it will be only a few per cent larger and brighter than the average full Moon. However, our Moon will fade to a dim red because it will also undergo a total lunar eclipse -- an episode when the Moon becomes completely engulfed in Earth's shadow. The faint red colour results from blue sunlight being more strongly scattered away by the Earth's atmosphere. A January full moon, like the one visible tonight, is referred to as a Wolf Moon in some cultures. Tonight's supermoon total eclipse will last over an hour and be best visible from North and South America after sunset. The featured time-lapse video shows the last total lunar eclipse -- which occurred in 2018 July. 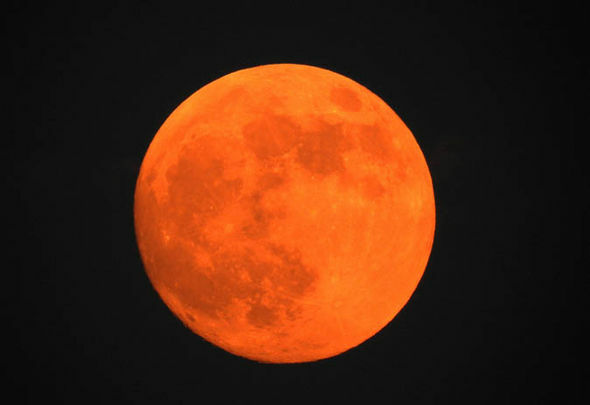 The blood moon prophecy was a series of apocalyptic beliefs promoted by Christian ministers John Hagee and Mark Biltz, which state that a tetrad which began with the April 2014 lunar eclipse is a sign of the beginning of the end times as described in the Bible in the Book of Joel, Acts 2:20, and Revelation 6:12. The tetrad ended with the lunar eclipse on September 27–28, 2015.